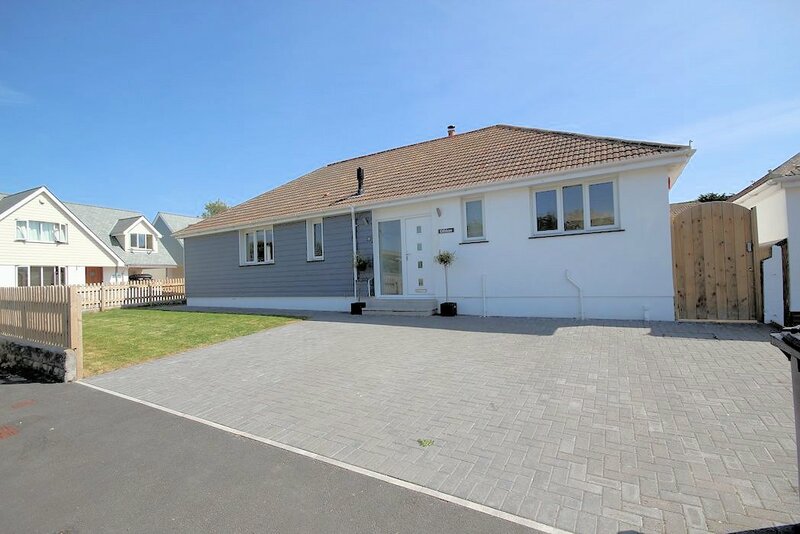 Fabulous 4 bedroom holiday home, extended and fully refurbished and just minutes from the famous surfing beach of Croyde and a short walk to the village. Lovely furniture and furnishings, plus hot tub! 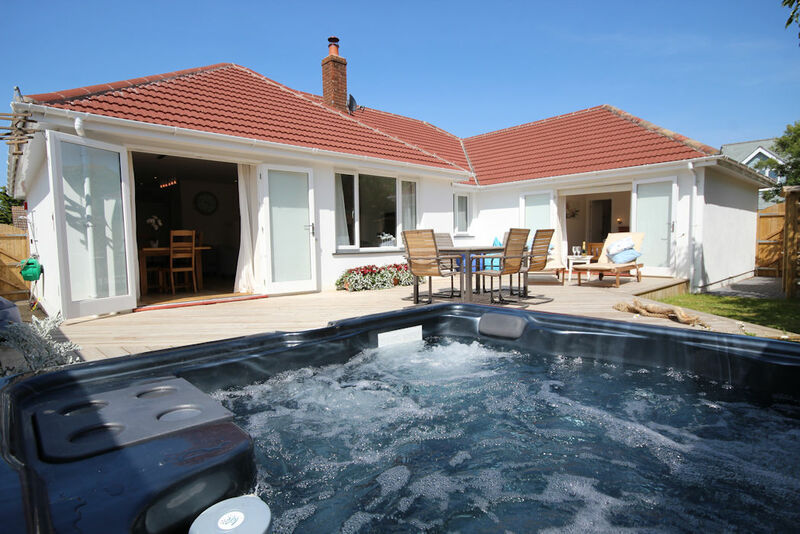 Offshore is a very stylish and modern, quality 4 bedroom property with open plan kitchen/living/dining room with oak flooring, inset fire and french doors out to a decked terrace with tables and chairs, and a hot tub! Utility room for clothes drying and outside shower for washing off after the beach, secure gate coded garden and driveway parking for 2 cars (also unrestricted road side parking). The master and second bedrooms have a dressing room and en-suite shower room, flat screen TV and the french doors in the master bedroom open onto the decked terrace. There are two twin bedrooms one having a widened doorway for wheelchair access. The family bathroom has a 'P' shaped bath with shower over and there is also a wet room with folding shower seat and hand rails for disabled guests. Offshore is located in Sandy Way where the footpath leads to the beach and the village and children do not need to walk on main roads. The kitchen has a breakfast bar area, ceramic hob, electric fan oven, dishwasher and well equipped with cooking utensils and crockery. 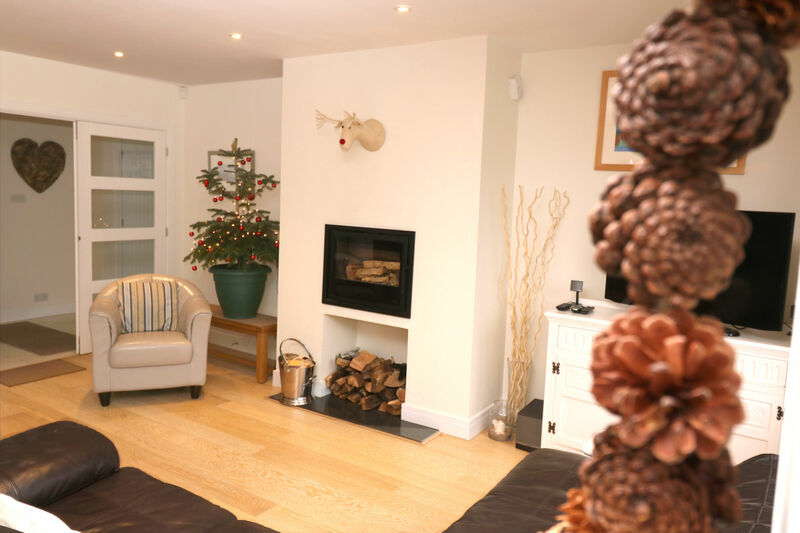 Living area with log fire, flat screen TV with freeview, built in DVD and Blu Ray player, comfortable seating for 6 plus large bean bags for children that can also be used outside. Dining area with large solid wood table and seating for 8. Both double bedrooms have flat screen TV's with built in DVD players, 2 en-suites and 2 dressing rooms. 2 further bedrooms are arranged as twins. Family bathroom plus wet room and outdoor shower. Outside there is driveway parking for 2 cars and unrestricted road side parking, large decked terrace with table and chairs for 8, coal BBQ and hot tub. Ideal for wheelchair users. Please contact us for more information and to ensure that the ramp is installed for your arrival. This property is pet friendly between October and March.